Encouragement's encouragement no matter who you get it from...unless it's your mom, cause she basically has to. And's constantly on 'ludes. Inspired to continue drawing by a most unlikely source, the man behind WolfBat Studios. Encouraged by a blind grandfather who told him "over and over again that his drawings were good", the artist behind WB's aggro prints claims inspiration from the "raw high-energy imagery of the skateboard and punk rock scene" of the 80's, and's had his outlandish work featured in Philly street parades, Oklahoma "dragon slayings", and the most logical stage of all: a Barney's window display! Most prints're pulled from hand carved linoleum/wood blocks and done on archival paper, including a series worked up for Anti-Hero skateboards that features a trench coat'd figure holding a smoking Tommy gun above four bullet-riddled bodies, and a prominently testicled bat sticking out his tongue & spreading his wings like a flasher, perhaps in an attempt to bug people out...so he can eat them! 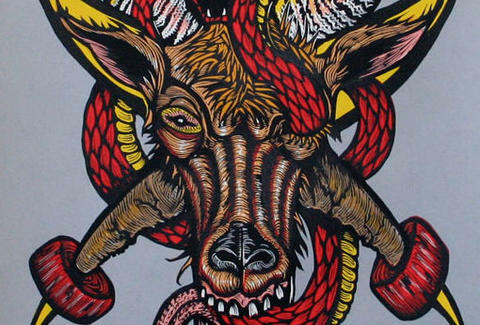 Further animal riffs run from a creepy, undulating centipede, to an owl striking the famous Michael Jordan wingspan poster pose, to a demonic goat chomping on a bright red viper tangled up in his horns, because everybody knows that boas are totally out of style. 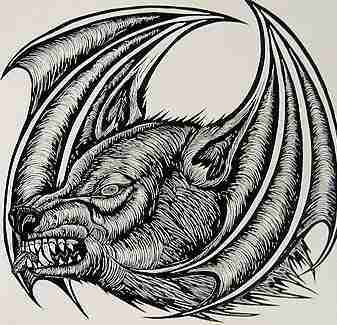 If you don't see the print you want for sale, WB claims he can work up on-request anything you see on the site, expanding your options to include the WolfBat: a snarling wolf with ears that turn into bat wings, an image you can also feast on by raiding mom's supply.